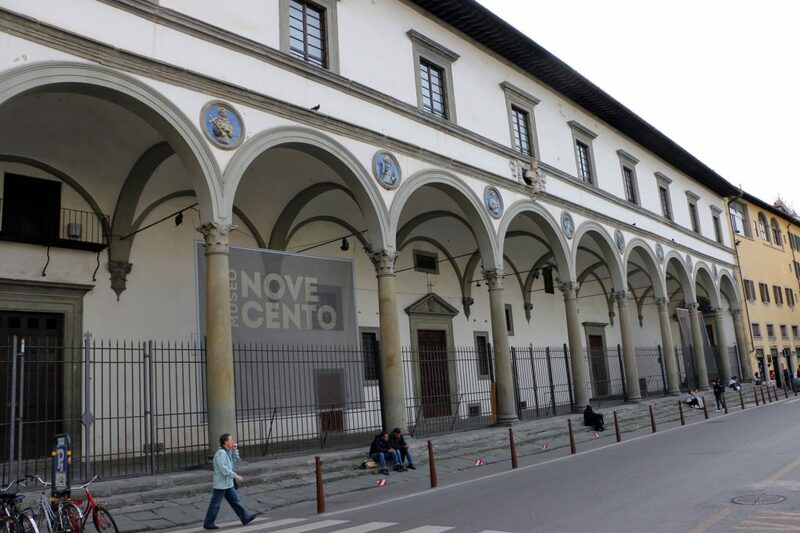 If you’re looking for a bit of contemporary art in Florence during your visit this December, look no further than the Uffizi Gallery, Palazzo Strozzi and the Museo Novecento! The city of Florence is an open air museum and most of the art and masterpieces date back centuries. But in an attempt to ever be a center that attracts artists, the city has to also focus on contemporary and modern art and this can be seen often through temporary exhibits dedicated to more recent artists of the 20th and 21st centuries. Let’s look at what is going on this fall and winter in Florence. Most people likely have heard of Ardengo Soffici and will arrive at the Uffizi and not stop to see the extra temporary exhibit dedicated to this important figure in Italian art and culture of the 20th century. But if you’re looking for a bit of more recent art in Florence than the majority of the work you’ve already seen at the Uffizi itself, this is a great chance to see the work by Soffici as well as work by his contemporaries – such as Picasso – that impacted the course of art and culture in Italy in the decades between the two great European wars. Ardengo Soffici was a painter from near Florence, an art critic and intellectual from the early 20th century. He played a key role in renewing and modernizing Italian culture and art in the first decades of the 1900s, organzizing the First Italian Exhibition of Impressionism in Florence in 1910 which included works by Cézanne, Degas, Renoir, Monet, Pissarro, Gauguin and Van Gogh. Read more about the exhibit here. Ai Weiwei is one of the world’s most celebrated and influential contemporary artists and the exhibit at Palazzo Strozzi this fall/winter is Italy’s first major retrospective exhibit dedicated to the artist. With old and new works, the exhibit includes monumental installations (just head to the outside of Palazzo Strozzi to see Reframed, pictured above), sculptures, objects, video and photography. You’ll find works across the entire Palazzo Strozzi: exterior, courtyard and the piano nobile. Ai Weiwei, a dissident artist, is a leading voice in the international art scene and China’s most famous living artist. 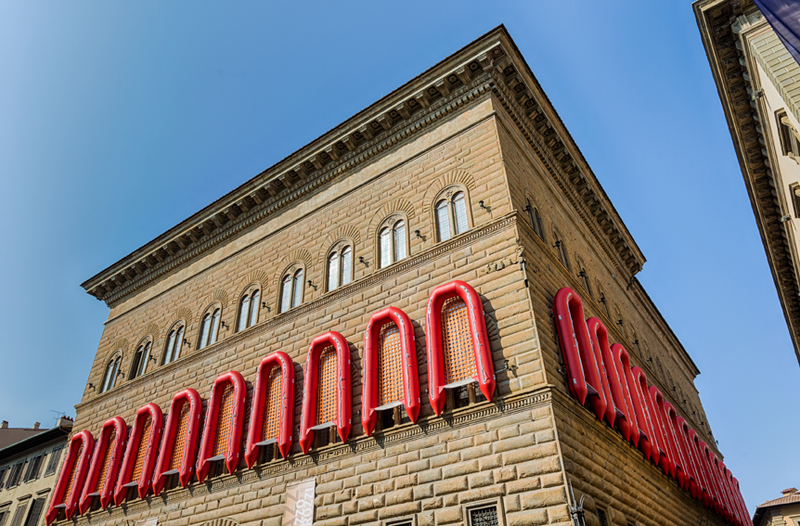 Whether you know Ai Weiwei’s work or not, a visit to Palazzo Strozzi this season will open your eyes to current, modern art opposed to the rest of the art you’ll see across Florence. And if you’re in Florence on Christmas Day or New Year’s Day, Palazzo Strozzi is one of the few museums which maintain their doors open on holidays so take advantage! There is a café in the courtyard, perfect for a break during your day of sightseeing where you’ll be able to admire the context of the great Renaissance palace itself. Learn more about the exhibit on our post on Ai Weiwei at Palazzo Strozzi. There are currently two temporary exhibits at the Museo Novecento, or Museum of 20th Century Art, whose entire collection is dedicated to the works of contemporary art the city has collected over the last 120 years or so. The first one listed above is dedicated to commemorating the 50th anniversary of the 1966 flood that severely hit Florence and which destroyed or damaged a lot of the city and its artworks. However tragic the event was, the city was much loved and received support from the international community. Part of this love and support was shown by contemporary artists through donations of their own works to the city to build an “Uffizi of Modern Art” and compensate the losses Florence had suffered from the disaster on older pieces of artworks. Since the Museo Novecento finally opened in 2014 but only has space to showcase about 300 works total, many of the pieces donated after the 1966 flood remain in its deposits. This is your chance to see some of them on exhibit for the first time ever! If you want to learn more about the 1966 flood and the artists that donated works to the city, I’d highly recommend you read Jane Fortune and Linda Falcone’s “When the World Answered: Florence, Women Artists and the 1966 Flood“. The Advancing Women Artists Foundation which the two are part of is focused on helping restore and display work by women artists in Florence that remains hidden from view in the city’s many museum deposits. Through the last decade, they have, one by one, funded the restoration of many artworks and held special exhibits in Florence to showcase women artists work through the centuries, most of which the general public does not even know exist. While the current exhibit at the Museo Novecento is not focused solely on work by women (of which the book focuses on), it turns out that many of the works donated by the “Flood Ladies” still remains in storage and not on display: so this is your chance to see many pieces of artwork hardly ever seen and by the Flood Ladies, in particular. The second current exhibit at the Museo Novecento also merits visiting: Gaetano Pesce, a contemporary artist, is a great name in Italian architecture and design from the 20th century. The exhibit gives us the chance to reflect on his work as well as the themes he focused on, particularly the feminine “condition”. Since the end of the 60’s, he has centered his inter-disciplinary research on women and the whole female world, by connecting his intuition and the deepest and most archaic aspects of being a woman to the social, political and economic situation of our time. Conversations on the Exhibit: Answers to the Flood by Artists – an occasion to converse about a central part of the entire museum’s collection, with many works being part of the donations offered to the city of Florence by international artists after the 1966 flood after the appeal of art critic Carlo Ludovico Ragghianti to contribute in this manner. While some works are on permanent display within the museum, many others are still in the museum’s deposits. January 8 at 10:30am and 12pm – lasts about an hour – cost 6-8 euro for exhibit, not including visit to museum.